Slim fit shirts are the only cut of dress shirt you should wear if you're under 30 years old and style is important to you. Styling is easy if your swag is correct. 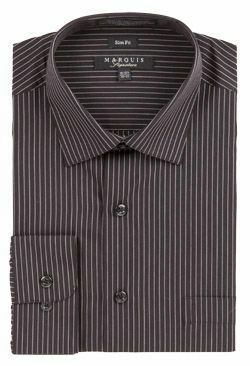 If you are in good shape, show the crowd that you can wear a slim cut dress shirt with ease. This black pinstripe slim fit dress shirt has a slim cut and is a born natural to wear with flat front pants and slim cut suits. Shop online for Slim Fit Suits here.